IOOF Hall. Photo by Cole Good, 2015. 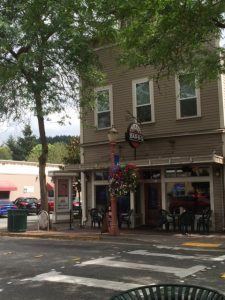 This is the oldest remaining commercial structure in Issaquah, having been constructed in 1888 by The Gilman Lodge # 69, of the Independent Order of Odd Fellows. 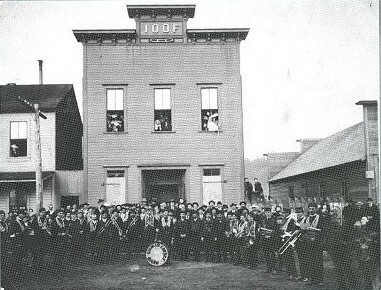 The Issaquah Odd Fellows Hall was constructed in 1888, the same year that the Issaquah chapter (Gilman Lodge #69) of the International Order of Odd Fellows formed. Mr. Andy Reynolds, Superintendent of Grand Ridge Coal Mine, and Mr. W.W. Sylvester, President of the Issaquah State Bank, were members, as were most of the businessmen in Issaquah. The Odd Fellows Hall was an important addition to the town in the early days because it provided a central meeting place between the North and South regions. The first moving picture shows in Issaquah were shown at the hall. Mrs. Arabella Francis Wilson played the piano for the silent films and her daughter Minnie (Mrs. J.H. Schomber) sang the songs illustrated on slides during intermission. The Moving Picture Show contracted for the regular use of the Hall to have Saturday afternoon 5 and 10 cent matinees & double features at 8p.m. at regular price. Around 1904, the ground floor to the Hall was rented out as a grocery store and served that purpose with several different owners. The building was nearly destroyed by an arson attempt in 1908, and later by a severe windstorm in the 1930’s. The International Order of Odd Fellows held meetings in the building into the 1960’s. It has also housed many different businesses ranging from grocery to antique stores and served as an entertainment center showing movies, hosting dances and other entertainment forms. As of 1999 – there are still local members of the International Order of Odd Fellows, but they no longer own or use this building. The lower story is used as an antique store, and the upstairs serves as the surprisingly modern headquarters of Vialight Corporation. As of April 2000 – The Odd Fellow group in Issaquah has officially disbanded, and the Vialight Corporation has moved on to larger quarters. As of August 2000 – The building has sold and is now undergoing restoration. Among other enhancements, it has received a new roof, new backing has been installed on the false front, and the original recessed front entry way is being recreated. 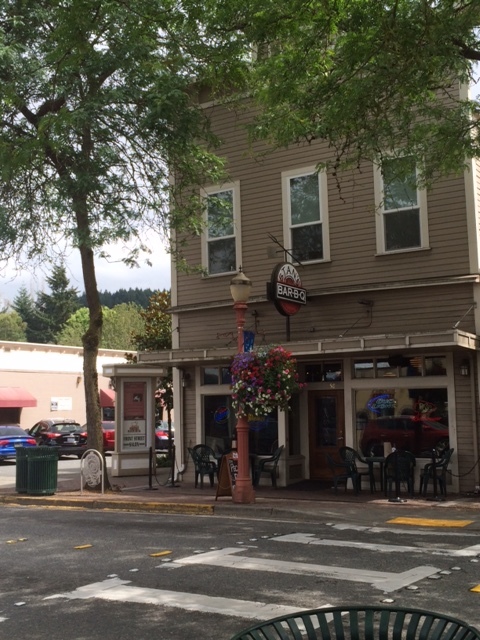 Odd Fellows Hall is a uniquely intact example of an early pioneer wood frame commercial structure in Issaquah’s original downtown. It is a 2 story rectangular form with a medium pitched front gable roof and a western tiered false front at the street. The front (west) and north walls are horizontal flat plank siding. The tiered parapet is decorated with 12 scrolled brackets and a wide cornice and frieze. The letters “I O O F” (for International Order of Odd Fellows) with a three link chain appear in wood relief on the top tier of the false front. The tall narrow windows have been sympathetically replaced with 1-over-1 double hung aluminum frame windows. A marquee, not original, is suspended over the storefront which has a pair of French doors centered and plate glass display windows to each side.